NorState FCU lives by the Credit Union philosophy of "People Helping People.” Credit unions across the country, including NorState FCU are committed to their communities, offering financial services to underserved populations, engaging youth in financial education, returning profits to their members, and supporting volunteerism. That's why NorState has established a volunteer program that encourages staff to give back to our communities. From volunteering at a local food pantry to spending time at an animal shelter to landscaping at a local park, our staff is dedicated to making a difference in our communities. NorState FCU donates its annual member fees collected from our coin sorter machines located in Fort Kent, Madawaska and Presque Isle. Our 2018 charity was the United Veterans of Maine - Farm of Hope in Caribou, ME. 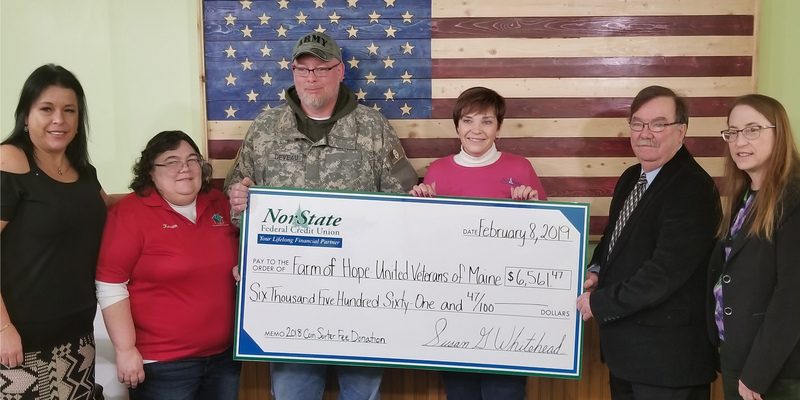 NorState FCU presented them a check for $6,561.47 on February 8, 2019. Our 2019 charity will be three organizations that serve adults with special needs in our communities. St. John Valley Associates (Madawaska), Northern Aroostook Alternatives (Van Buren), and Central Aroostook Association (Presque Isle). NorState Federal Credit Union’s Ending Hunger Campaign is a yearlong effort to raise awareness and funds for local food pantries throughout Aroostook County. NorState FCU’s local efforts raised over $20,430 in 2018! Since the 90’s, Maine Credit Unions have collectively raised over $8 million to help end hunger in Maine. 100% of all money raised stays in Maine and is distributed back into the communities that raised those funds. All contributions are tax-deductible. To make a contribution to the Ending Hunger efforts, with pantries in Fort Kent, Eagle Lake, St. Agatha, Sinclair, Frenchville, Madawaska, St. David, Grand Isle, Van Buren, Ft. Fairfield, Easton, Presque Isle and Ashland, stop by one of our credit union branches, or send check made payable to NorState End Hunger Campaign, 78 Fox Street, Madawaska, ME 04756. From December 1st to December 31, 2018, NorState FCU with it's branch locations in Madawaska, Van Buren, Eagle Lake, Ashland, Fort Kent, and Presque Isle, along with local businesses helped to collect over 13,800 lbs. of non-perishable food items for our local food pantries.